When we move, my 2 younger daughters (Brooklyn 7, Ava 3 1/2) will be sharing a room. Having already had sleepovers (unsuccessfully) I know there are a lot of giggles and a lot of shushing. I would love to have twin beds side by side but it takes up room and it's easier to be distracted when trying to fall asleep. So bunk beds it is. It's also a very exciting reason to share a bedroom! Love that Ikea has an affordable pine version that is easily paintable in whatever colour you like! This version below would eliminate the need for a bed rail. But, I don't think it would be appropriate when Ava is 7. I'm very excited to be collecting inspiration and ideas for the girls' bedroom. 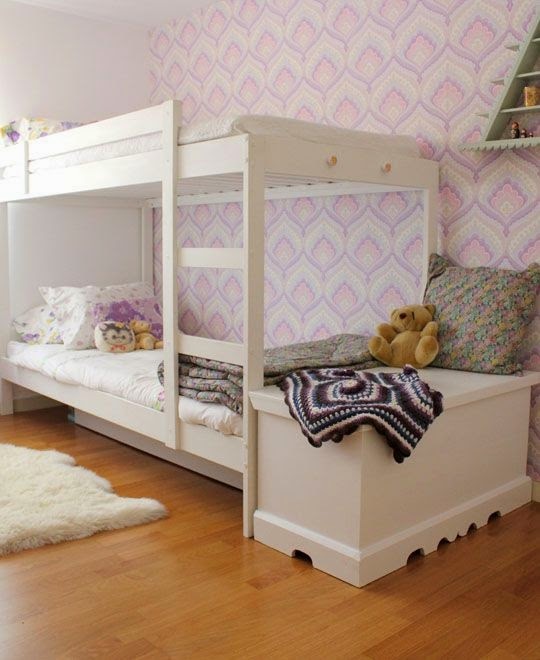 Charlize's room won't need any change, just good storage and desk ideas.